Every project that comes into the MillerCox studio is a custom job, managed from start to finish by one of our team leaders. You’ll always talk to someone who has the experience to make sure your job is completed on time and on budget, and the authority to make commitments. As a bonus, you’ll also be talking to someone who values your input, listens to your suggestions, and is thankful to have you as a client. The first step is a meeting to learn more about your design needs. We’ll review your project objectives and time and budget parameters and make sure we understand your key messages, deadlines, target audience and most important, how the success of your project will be judged. If your project seems to be a good fit with our skills and experience, we outline the scope of the work and our recommended course of action, the costs involved, and a preliminary production schedule. 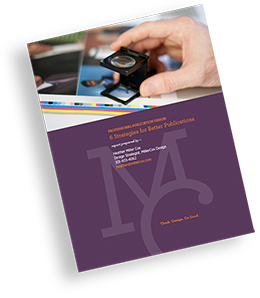 Before we begin work, we’ll present a preliminary cost estimate that also includes outside resources (such as photographers and printers) that we think will be critical in achieving your project objectives. Simple print publication design projects can run as low as a few thousand dollars; more complex ones, especially those with many moving parts, can run into the tens of thousands. We never begin work on a project until our client has approved the estimate, and we stand by our estimates. If you ask us to change the scope of the project, if deadlines are changed, or additional design services are requested, we re-estimate, so you’ll never be surprised when the invoice arrives. If only life were like TV! We’d sit at our drawing boards daydreaming while we waited for that flash of inspiration when everything falls into place. The truth is that it takes some trial and error to come up with a design that meets all of our stated objectives. For that reason, we normally ask for up to two weeks to develop design options. Surprisingly, often the simpler the design solution, the more time, energy, and professionalism it takes. Clean design requires continual simplification through many iterations, to arrive at only the elements required, presented with just the right aesthetic. If your design project has many moving parts (a brochure system, for example), we save you money by showing designs of only a few representative elements. We don’t design every single piece in the system until you have approved an initial concept. After all, we may need to modify the design based on your feedback and questions. Once we have arrived at an agreed-upon design, we’ll apply it to all the other elements of your project. Your design isn’t working hard for you until your project is printed or posted on your website and attracting new supporters. But if you’re like most people, you don’t purchase these outside services often, so you may not be sure that you’re choosing the best print vendor for the job, or paying a fair price. MillerCox can help you there, too. In addition to design services, we can recommend appropriate vendors, supervise production, make sure your finished product meets your expectations and review invoices from the vendors. If you already have preferred vendors, we’ll be happy to work with them to make sure you’re completely satisfied. If you’d like to schedule a get-acquainted call, please call us at 301-933-4062. We look forward to hearing from you!